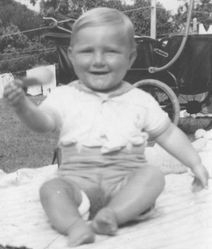 On January 23rd 2009, my brother-in-law, Eric Bridgwood, rang to tell me that he had been contacted by Danny Oldacre and his partner Jen in respect of Danny’s father, Kenneth Rickwood, now eighty one. It soon became evident that Kenneth was a brother that my mother never knew of and an uncle that I never knew. 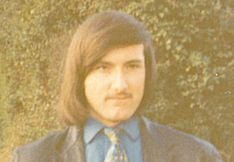 I contacted my own family as well as Danny and Jen, and there was general delight and excitement to have discovered Kenneth. As a result of this contact, I found myself re-examining the family tree I had started in 2002 but had left with only my mother’s maternal side charted. I had hit a brick wall on her paternal side, and for six years had put the tree to one side. Eric had made great progress with his own family tree using the resources at Ancestry.com and this encouraged me to pay for a month’s research there too. £13 was the cost for one month. I have subsequently paid for two other months access at different times in the summer, but you should be able to find all that you need in the course of one month. Genes Reunited offer equally good research facilities. For me, it has all become quite a hobby or vocation even. 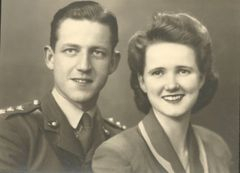 Previously, I had relied solely on free websites such as FamilySearch.com and the BMD websites for Cheshire,Yorkshire and Lancashire. 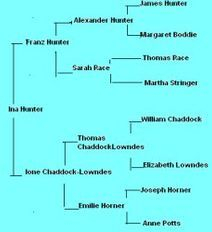 Plus Mike Lowndes own family tree, which had been my initial springboard back in 2002. Excellent as these resources are, they do not give access to the incredible census returns of the 19th Century. It was there that I made the discoveries that have shaped these pages, and turned a list of names and dates into a real family history full of revelation, surprise and poignancy. Human stories unfold before one's eyes. As the months went by, the family tree that I had started at Genes Reunited grew and grew. As I passed each century of leaves, I thought it must end now, the tree is surely completed. But only now in early September, having just passed 700 leaves, can I say that everyone who should be on the tree, is now there. The beauty of Genes Reunited is that your tree can be looked at by others who share relatives with you. The more relatives you put on, the more chance there is of contact from others at Genes. This is why I have chosen to include some obscure relatives in order to widen the net of contact. I am indebted to several distant relatives, whose trees I have shared in this way, such as Eugene Godden and Murray Upton. But most of all, it has been Ann Hunter who I have learned so much from during our correspondences. 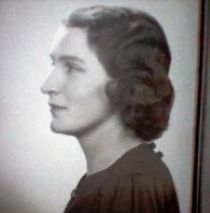 One becomes something of a genealogical detective in making a family tree, and there is none better than Ann. She has corrected errors on my tree, challenged other assertions I have made and kept me very much on my toes. Knowing that there is a fellow detective on your case as you build your tree is very challenging and stimulating. I should add that to have your family tree permanently on show at Genes costs about £1.65 per month. This includes access to anyone else’s tree that is relevant to your own. A very small price to pay. The most exciting moment discovery of the past six months was finally opening the door to the Hunters of Aberdeen, without which I wouldn’t have made contact with Ann. I must thank the 1901 census for that, and Stringer Hunter staying with his uncle James in Aberdeen. 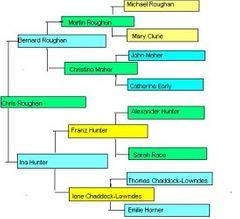 Another breakthrough was sharing Eugene Godden’s tree and thereby discovering Bernard Roughan’s ancestry in full. 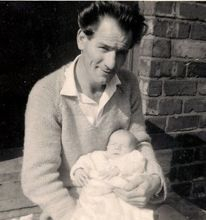 Not knowing my birth father, I chose to regard Bernard’s ancestry as my own. From my sisters’ perspective, it is indeed their ancestry. So, in that respect, this family tree is more Sharon and Jane’s than it is mine. I was, in due course, able to add missing people and information to Eugene’s tree, just as I did, occasionally, to Ann’s tree. It really has been a case of give and receive. Another magical moment was receiving a short history of the Procters on PDF, complete with photos. You may wonder why the Procters section is disproportionate in length compared to the rest of the history. After all, their inclusion is only by way of my great grandmother Emilie’s sister Annie Horner’s marriage to James Procter. If I had gone into similar depth with others marrying into our family, this history would be at least double its current length.The reasons for the space given to the Procters are twofold. Firstly, when one receives such an extraordinary insight into a family as I did with the Procters, one feels obliged to do it justice. So much of the work I have done here is with relatives lost in the mists of time with very little information about them. I have worked alone on this project with few family resources and personal recollections. Had I started it twenty or thirty years ago, I could have sat down with relatives who might have brought many of the people I have written about to life.The Procters document does exactly that and consequently serves that purpose here. Secondly, there has been one shining beacon that has focused our family for many years and that is Ramsdell Hall. It’s as if, in different ways, we all want to connect to it, to touch it, certainly to visit it and see it with our own eyes. 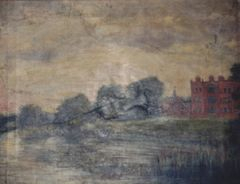 Since the late 60s, the two oil paintings of Ramsdell Hall that have been in the family, have been an inspiration to many of us. Our ancestral home. Who painted these pictures? Until this year we never knew. After all,her name was only written at the bottom of the painting waiting forty years for one of us to read it. Irene Hortense Procter. A few minutes research soon brought Irene to life, and a branch of the Horners that I had overlooked. 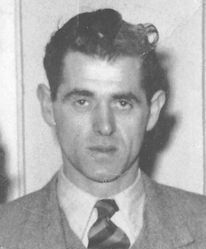 Irene’s maternal grandfather was Joseph Horner. He is my maternal great-great-grandfather. But without that PDF, the Procters would occupy a much smaller part of this history. Thanks to this family history project, I am now writing a novel where the main character goes back in time to meet his ancestors at Ramsdell Hall. 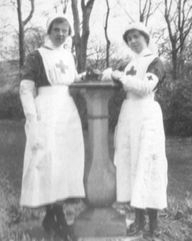 It is currently on its fiftieth page and whilst it is fiction, it uses much of the information contained in this family history. Meeting your grandmother when she was just five is rather fun. 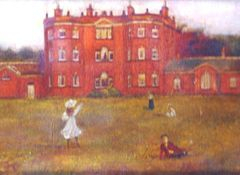 Not to mention getting to know the young lady who painted Ramsdell Hall and holding a midnight concert on the lawns, attended by the famous ghost of the Hall. Time travel is so easy once you’ve learned how.Thank you Irene for the inspiration. You will notice constant reference to christening dates rather than birthdates. The former are readily available at FamilySearch.com or in Parish Records. Had I thousands of pounds, I would have sent away and obtained many relevant dates of birth not available on the internet. I did so on one occasion, in order to get an astrological perspective on the heroine of my novel. Similarly, had I visited the relevant churchyards, I would have been able to obtain many more birthdates than I have. For the first time in my life, I think a car might have been rather useful. However, I have to be content with what information I have found, and a huge debt of gratitude is owed to the Latterday Saints at FamilySearch. Their freely available resources are simply awesome. I finally got to visit them in person in Exhibition Road, London last week. I drink a toast[of lime juice] to these good people. So,where a date of birth is not known, the christening date is given. This establishes the year of birth and pretty much the month. The following might be of interest, concerning the Irish tradition of choosing names but I would think it might be true to some extent for non-Irish people too. Censuses feature strongly throughout this history and without them, the project would not have been possible.They tell you much about each person recorded on them and reading between the lines, you can soon build quite a picture of the person and their family. Maiden names become middle names, and in some cases, christian names. You can follow the life of a person by opening four or five censuses even if there is no record of their birth or marriage. Amazing. One’s detective skills are tested to the full, and family joys and sorrows are uncovered by piecing together the facts. To be honest, there have been times when tears have flowed as I have discovered relatives whose lives have been cut tragically short, and whose children have suddenly lost a parent or both parents at a tender age. It makes one remember how fortunate one is to reach any age at all. Surely every day in our lives is a bonus. Nothing must ever be taken for granted. 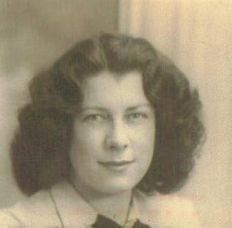 My mother only lived to be sixty one but ‘relatively’ speaking, she did quite well. 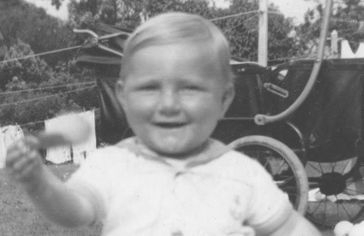 I felt it necessary to constantly ‘interrupt’ sentences with dates of birth, christenings and marriages, as well as names of parents, children and places. This is because,ultimately,t his history is a written version of the family tree itself. Yes,there are anecdotes, scenarios, attempts at humour[now and then] and other bits and pieces. But the essential ingredients have to be the names and dates—the facts themselves. 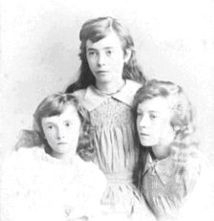 Rather than just list them, I have chosen to weave them into this family history. A biography of our family. Anyone whose images I've used and wish me to withdraw them, please let me know. Otherwise, thank you to all those who have provided some wonderful pictures on this amazing internet. Here is my ancestry, and that which my two sisters have continued. The latter I have limited in content because writing about the living might result in complications. 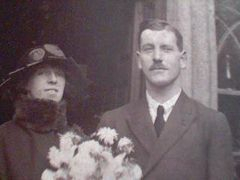 Similarly, it is not my place to write about the wonderful family of my mother’s brother, Uncle Alastair. Their story is their own and a wonderful one at that. Equally so, other close living relatives. Therefore it is the past that I turn to. 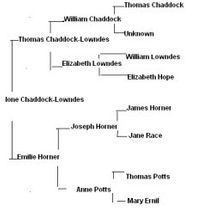 And you must turn to the next page to meet my first ancestor who finds herself in the Chaddock-Lowndes section, along with her siblings. I’m sure they won’t mind taking their mother’s maiden name here. So that's it from me and the little me in the picture below.